Signs of the Times with George Kirchmann. 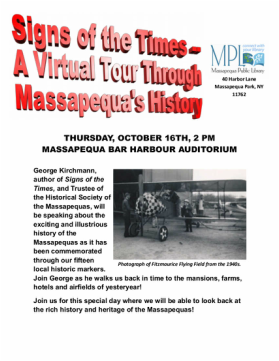 George Kirchmann, author of Signs of the Times, and Trustee of the Historical Society of the Massapequas, will be speaking about the exciting and illustrious history of the Massapequas as it has been commemorated through our fifteen local historic markers. Join George as he walks us back in time to the mansions, farms, hotels and airfields of yesteryear. Just stop by the Massapequa Bar Harbour Library on October 16th if you are interested in attending this program!